Damn now this is the way this club worked back in da day !!! Hope this works for you !!! Yeah I'm so glad to get help. I always try to help others too if I see something and know anything about the subject. Last edited by Bassman-Soundking; 03-27-2019 at 07:45 PM. The original problem still persists. This thread was to resolve what the mechanic broke whilst diagnosing the rattling sound from pulley area. I thought water pump. He thinks AC clutch. Is there a way to diagnose myself? Really can't afford a real mechanic right now. Last edited by Bassman-Soundking; 04-04-2019 at 10:30 PM. (1) Using an ohmmeter, measure the resistance between the terminals. and check the movement of the valve. 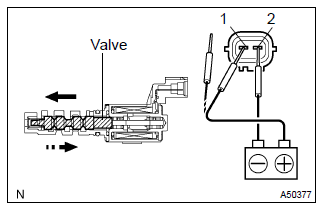 Confirm the valve moves freely and does not stick in any position. Foreign objects in the oil can cause subtle pressure leaks in the valve. The pressure leak will cause the cam to advance, this condition will usually set a DTC. When you remove the OCV, in addition to the above tests, it may be worth it to also give a quick clean, using non-chlorinated brake clean, or other sensor safe solvent of your choice. Also depending on your oil change intervals, an oil/filter change may also alleviate the issue if it is a debris/sticking issue. If new or verified good sensor, oil change/filter provide no improvement, and all your basic ignition components are also in good condition, I'd begin looking at cam/crank position sensors and/or whether the timing chain jumped a tooth. If things have improved, I'm glad that worked out for you. Hopefully I can now help with your original issue of some rattling noise coming from the belt-ish area. (b) Turn the pulley, and check that the water pump bearing moves smoothly and quietly. Basically with the belt off, just turn it, try to wobble it back and forth, by hand. There should be no significant amount of play in any direction, without any sticking points or "grittiness" when you rotate/spin the pulley. If you find any excessive play, wobbling, or grinding, you've likely found your culprit (hopefully the only one). Either the pulley is not snug on the water pump (3 bolts hold it on) or the pump bearing/shaft is done and the entire assembly would need to be replaced. For the A/C Clutch, you can use a similar method to the water pump if you'd rather kill two birds with one stone. With the clutch disengaged, the pulley should spin pretty freely with no excessive wobble or side/up-down play, no grittiness or grinding as you spin it. With the clutch engaged (apply 12v to the positive wire running off the clutch coil), it should be hard to turn but still no excessive play, grit or grinding. Otherwise, with the engine running and belt on, you can visually inspect that the clutch is engaging/disengaging properly by switching the ac on/off and watching whether the outer clutch plate gets pulled and then spins with the pulley. The same criteria can be applied to the other, alternator and vane(PS), pulleys as well. Hopefully that helps and you can figure out what's rattling around/causing your CEL. I got the cell light to go away by simply unplugging and relying the hardness to the VVT solenoid, and then resetting the codes. I will look at the pulleys as you explained on my daughter's next day off. The AC clutch does engage and the at blows cold. There's no water leaking afaik, but I will confirm at a later date. The alternator is the easiest to verify, but I don't think that's it. I'll pay back later this week hopefully with my findings.